Remove Bleeding Colors From Laundry - Help! If one color bleeds onto another is there a way to try to get it out? That is a common question Glenn. 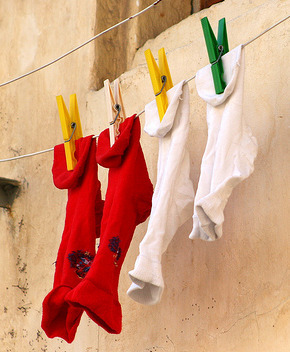 No matter how careful it seems we are when sorting our laundry there are times when that stray red sock, or other item gets slipped in with everything else and bleeds dye onto other clothing in the wash. When that happens you can try some products which are designed to get rid of that bleeding dye. The two that most readily come to my mind are Carbona Color Run Remover and Rit Color Remover . Please note that for both products you need to buy more than one, if you want to remove dye that has run onto a full load of clothing. For the Carbona product you need to use three packages, and for the Rit product four packages. If you don't want to buy a product just to fix your white clothes that have turned pink, for example, you could also try soaking them in a solution of oxygen bleach or color safe bleach and water. This is not guaranteed to work though, but is worth a try. The main thing to remember when trying to remove bleeding colors from laundry is not to dry the items in the dryer until the excess dye is removed. Otherwise, the heat of the dryer may set the dye stain in those clothes making it much more difficult, or even perhaps impossible, to remove. Of course, to prevent and stop fabric dye bleeding in the first place you should sort your clothes before washing. If you would like to wash more clothes together in a load, and are concerned about dye bleeding into your other fabric you may want to use a product such as Carbona Color Grabber Cloths or Shout Color Catcher Cloths , both of which are cloths designed to "grab" the bleeding dye which is in the water to keep it from redepositing on your other clothing. Does anyone else have any other suggestions for laundry dye stain removal to share? If so, tell us all in the comments. In addition, do you have your home management question to ask? If so, you can ask me your home management questions here and I will do my best to help.